The Apollo SRX400 combines the latest design, engineering and powerful feature set of the Apollo Series in a compact, versatile form. With built-in Wi-Fi streaming, Fusion's Digital Signal Processing, PartyBus connectivity and over-the-air software updates, the Apollo SRX400 is the perfect combination of intelligent design and superior sound in a compact zone stereo. The compact Apollo SRX400 zone stereo is designed for installation where minimal space is available, providing high quality audio reproduction from a compact form factor, either in a conventional flush installation, or integrated into a glass helm for a premium finish. The Apollo Series is intelligently simple and always up to date, thanks to the over-the-air software updates available from your smartphone or compatible device via the free Fusion-Link app. Built on Fusion's True-Marine design philosophy, the MS-SRX400 has an IPX7 water resistant front panel, and has been tested to a high level for protection against salt fog, temperature, vibration and UV protection. Party Mode: Wirelessly connect multiple Apollo stereos to play perfectly synchronized music throughout your entire vessel via PartyBus. 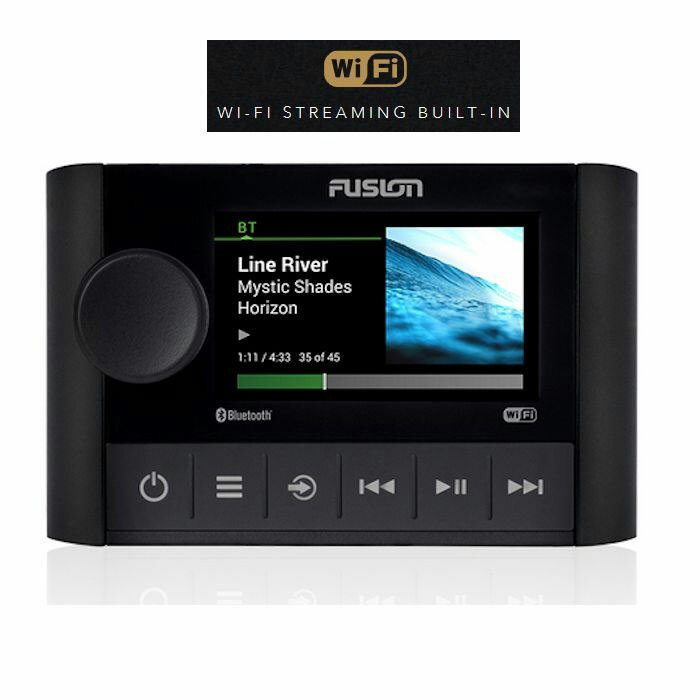 The Fusion PartyBus networking feature allows you to connect multiple compatible stereos and zone stereos together on a network, using a combination of wired or wireless connections. A Fusion PartyBus stereo, such as an Apollo RA770 stereo, can stream sources to other Fusion PartyBus devices connected to the network. Connected Fusion PartyBus devices can also control media playback on the Fusion PartyBus stereo. A Fusion PartyBus zone stereo, such as an Apollo SRX400 zone stereo can stream from a Fusion PartyBus stereo, but cannot stream sources to other Fusion PartyBus devices on the network. You can connect up to eight Fusion PartyBus devices on a network. In the image above, one Apollo RA770 stereo connects to a wireless router and to two Apollo SRX400 zone stereos . The two Fusion PartyBus stereo zone stereos can stream sources from the Fusion PartyBus stereo. A Fusion PartyBus zone stereo is not the same thing as a speaker zone. 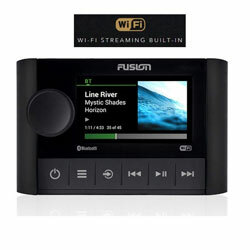 It is an independent stereo that can either play media from connected sources or stream from a Fusion PartyBus stereo on the network. You can connect a Fusion PartyBus zone stereo, such as an Apollo SRX400 zone stereo, to a single speaker zone. You can connect a Fusion PartyBus stereo, such as an Apollo RA770 stereo, to multiple speaker zones to cover a larger area with that stereo. Fusion PartyBus devices cannot control the speaker volume of another stereo. You can adjust the volume of speakers or speaker zones connected directly to the stereo only. See the Owner's Manual below for complete installation and setup information.